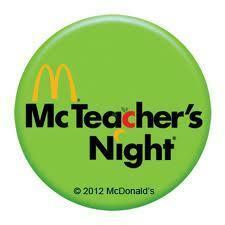 Please join us for McTeacher's Night on Tuesday, April 2nd from 4-8 pm at the Grandview McDonald's. A portion of each sale, including drive-thru, will be donated to our school. Students will have an opportunity to earn points for their House by signing our sign-in sheet at the restaurant, or they may show their drive-thru receipt to their teacher for the next day.